Tilt-Down Fence, a public art installation project that serves the local immigrant population currently residing in Dorchester is under process! Tilt-Down Fence is a temporary urban stage, a place and space for the local community and more. 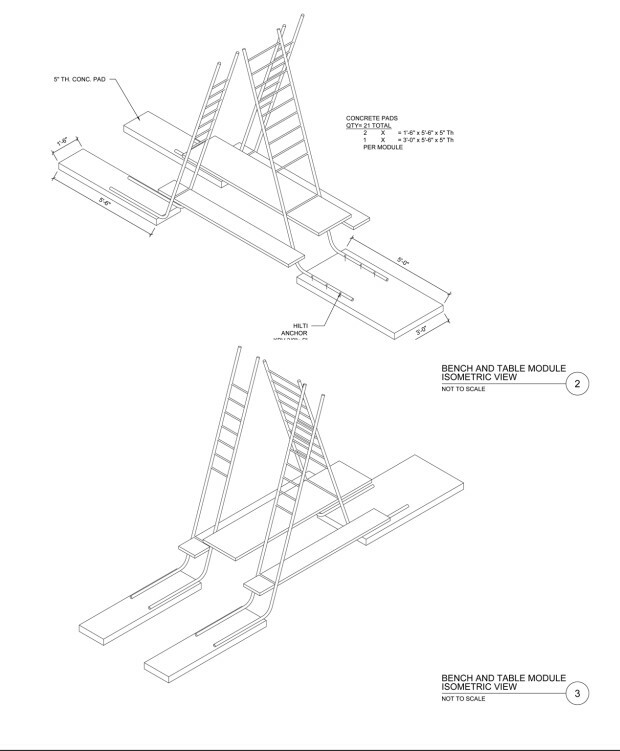 The installation is a series of 7 ladder bench+table systems in Fields Corner, Dorchester, MA that will be up for one month! The fence is a metaphor and has purpose. It’s a climbing structure [metaphor: the economic ladder] and a framework for adults to gather, support and network towards upward mobility. Being sited near the MBTA public bus stop, Tilt-Down Fence will also serve the community at large, the VietAID Au Co pre-schoolers, parents and the elderly population. 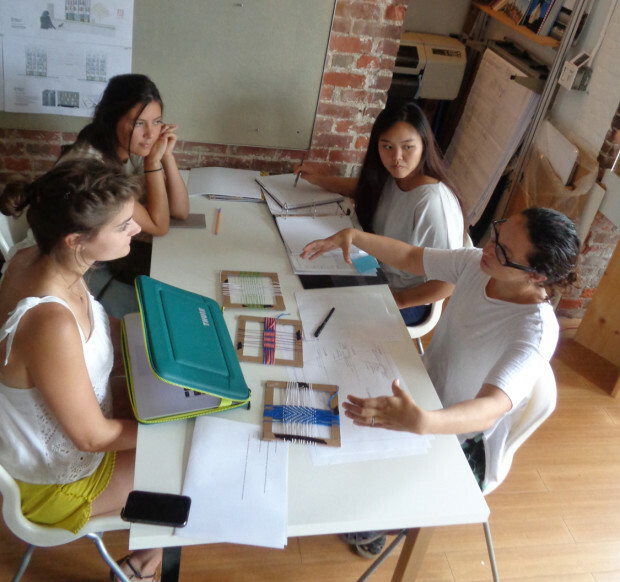 In the past few weeks, BR+A+CE has been recruiting textile artists , fabricators, and scheduling the entire process for our D-DAY deadline of Saturday, Sept. 3rd. We received approval from the MBTA, found a metal fabricator, had our first meeting with two textile artists who are on board full time, and are preparing everything we need to make the Tilt-Down Fence real! We are now purchasing and have ordered needed materials to fabricate and prototype before we go into full production, fabrication, and installation!! The project is conceived, fabricated and fund-raised by BR+A+CE. We rely on crowd funding to help us make the project a reality. Please help us make the Tilt-Down Fence real by making sure to visit our Donation page (link below) and “Like” our Facebook page to receive project updates. We have received donations from: The Boston Foundation (Vision Fund Grant), The Awesome Foundation, The Boston Society of Architects Foundation, and Viet-AID to initiate the project, but we are still fundraising and need your support! We are raising funds of $6,660 to fulfill the gap. Make sure to check out our unique Perks on Indiegogo we have for your contributions! As a non-profit organization, we rely on crowd sourcing and can use all the help we can get! Help us make a difference! Your contribution turns an underused green space into an active public art space for residents. Tilt-Down Fence is BR+A+CE‘s fourth public art project, following the successes of the Mobile Farm Stand and The Big Hammock Project at Rose Kennedy Greenway and at Adam’s Park in Roslindale, MA. The Tilt-Down Fence serves the community at large, the Viet-AID pre-schoolers, parents and the elderly population. BR+A+CE is currently consulting with the city to bring resources and services to advance and support the city’s immigrant residents. Your support will create new conversations about immigration communities, cultural exchange, and their contributions. The opening is tentatively on Saturday, Sept 3rd. We are planning events, activities, and more at the Tilt-Down Fence, so come be a part of the exciting event! We know some people just can’t contribute, but that doesn’t mean you can’t help us! Spread the word! Tell your friends, families, and colleagues about our project and fundraising! We would like to give this project a second life, please email us at ik@br-a-ce.org to bring Tilt Down Fence to your school or neighborhood park. Come visit us on Sept. 3rd at Fields Corner at our opening! We met with textile artists Isabelle and Michelle to discuss textile weaving techniques, material, and scheduling. Donations, our budget, and how much we still need to raise. We are thrilled to again be honored with a $1,000 grant from the Awesome Foundation, which will help defray the total project cost. The Boston Foundation (Vision Fund Grant) granted us with $7,500, the Boston Society of Architects Foundation donated $3,000, and the Viet-AID funded $500 to help offset insurance costs. Our total project budget, however, will exceed the total budget cost listed above and we could use your support! To fulfill the gap, we need to raise $6,660 by Sept 2nd. These funds will all go directly into the project. All donations to BR+A+CE are tax-deductible. Please contact us directly at info@br-a-ce.org if you require formal acknowledgement of a donation for tax purposes. …is comprised of designers, fabricators, students, and faculty brought together by BR+A+CE‘s Officers and Board of Trustees. The Tilt-Down Fence has been led by Iris Kim, Connie Wang, Petre Jariyanandhanetr and BR+A+CE co-founders Anthony Piemarini and Hansy Better Barraza. Together with Textile Collaborators Michelle Dunbar, and Isabelle Camarra, Structural Engineer Brett Schneider and enthusiastic volunteers, the hope is to create an interactive symbol of community. We have been fortunate to be aided by Viet-AID, who promotes civic engagement and community building, provides small business technical assistance and micro-enterprise development. Our board of trustees and advisers includes John Di Salvo, Kathryn Madden, Brett Schneider, Gretchen Schneider, Kamran Zahedi, Griscel Diaz, Lynn Hsu, Andrew Wise, and Antonia-Better Wirz. Many hands have helped us get to where we are; please visit the following tabs for a complete list of volunteers and sponsors.